Club L clothing is all about the party. 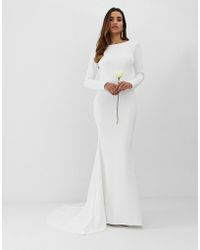 The brand's spotlight-loving designs are ideal for nights out and there are plenty of showstopper looks, whether that's a full-length gold maxi dress or slim cut bodycon style. It's not all about going out dresses though, there are plenty of chevron-print pants, crop tops and wrap skirts on offer too. Plus maternity wear. What more could you want?